Algae-based eggs are coming to the UK! Vegans rejoice this most momentous occasion with baked goods and egg dishes abound. Run to the nearest Holland & Barrett to pick up a carton or order it online. The reputed UK health store is among the first to have stock of these unusual eggs, called Vegan Eggs. The eggs are advertised as being a “whole egg replacer” in addition to being gluten, allergen, and cholesterol free. Vegan Egg states clearly that it is non-GMO, as to be expected of a product like this. The packaging includes some helpful instructions for preparing the plant-based eggs. There are different classifications when it comes to vegetarianism. The classic vegetarian, a lacto-ovo, eats dairy products and eggs. Lacto-vegetarians eat dairy products, abstaining from eggs, while ovo-vegetarians eat eggs, abstaining from dairy products. For many vegetarians, eggs were never removed from their diet. Vegans, however, do not allow animal products or by-products into their diet. This includes meat, eggs, dairy, honey, and gelatine. 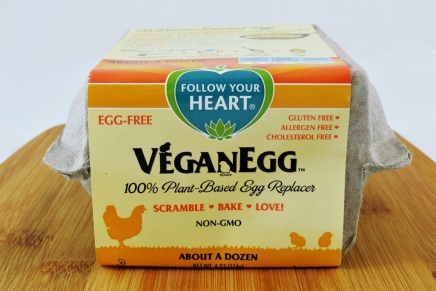 Before you start imagining a world replete with shelled vegan eggs, bear in mind that these eggs come powdered, albeit in a deceptive package. 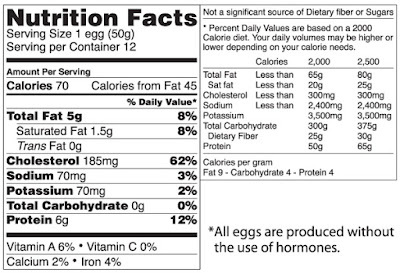 A 114g carton equates to 10-12 standard eggs. Hen eggs are a great source of nutrients, providing good cholesterol, Omega-3 (in enriched eggs), and a slew of antioxidants. The quality of eggs is directly related to defining terminology, where free-range and pasture-raised eggs are more nutritionally superior to caged and even cage-free. Below we compare Vegan Eggs with Farmers Hen House Pasture-Raised Organic Eggs. To lessen confusion, we will refer to Vegan Egg as VE and Farmers Hen House Egg as FHH. VE satisfy a need in the market as they are completely free of animal products and by-products: whole algal flour (recently in the news for causing gastrointestinal distress), whole algal protein, modified cellulose, gellan gum, calcium lactate (plant sources), carrageenan, nutritional yeast, and black salt. Some of the additives have somewhat questionable backgrounds, some with minimal research on how they affect humans. A purchase of Vegan Eggs will warrant a perusal of the internet simply to get a grasp on the listed ingredients. On the other hand, FHH are purely and solely contain eggs. The serving size for Vegan Egg is 10g; to correctly compare, we must multiply the nutrition facts of Vegan Egg by five to match the Farmers Hen House Egg serving size, 50g. Calories: FHH contains 70 calories while VE contains 200 calories. Fat: VE has more fat, 7.5g, than FHH, 5g, but has no saturated or trans fat. FHH has 1.5g of saturated fat. Cholesterol: FHH has a significant level of cholesterol, 185mg, while VE boasts no cholesterol. Sodium: FHH has a low sodium level, 70mg, while VE has an abnormally high sodium level, 1100mg! Potassium: FHH has 70 mg of potassium while VE does not have potassium listed on the nutrition label. Protein: There is small variance in protein, with FHH having 6g and VE having 5g. As per the comparison, Vegan Eggs are high in calories, have no saturated or trans fats, contain carbohydrates, and are completely overloaded with sodium. Their protein content is very similar to traditional eggs. However, Farmers Hen House Pasture-Raised Organic eggs contain potassium and are lower in calories, carbohydrates (none! ), and sodium. Additionally, they have more fat and a high level of cholesterol. If you’re unsure as to how these powdered eggs are taste-wise, Joshua Ocampo of bon appétit is doubtful that the vegan label is worth the trade on flavour.